A good friend of mine decided not to go and see That’s Amore because Physical Theatre isn’t really his thing. I think he missed a treat. Anyone who’s a bit unsure about the genre should give this a go, because it stretches its boundaries and has very broad appeal. For a start, the taboo of words is thrown out of the window. Whilst the majority of the 70 minutes is delivered through movement and dance it is punctuated by, at first, vocal sounds and later with brief exchanges of words. There is also a spoken narration that interjects now and then to remind us of the brain functions and electrical impulses that make us feel and experience both the pain and the pleasure of love. Not that we need words to follow what the show is about – the title is a hint and the movement and the score, assembled from a wide variety of musical material, delivers an exploration of love in all its aspects. A series of projection effects complete the atmosphere. Sinuous movement takes us from the beginnings of human experience, reminiscent of the opening of 2001, through a continuous tapestry of scenes, interwoven so that we lose the boundaries between all manner of expressions of the emotion that drives so many of our decisions. 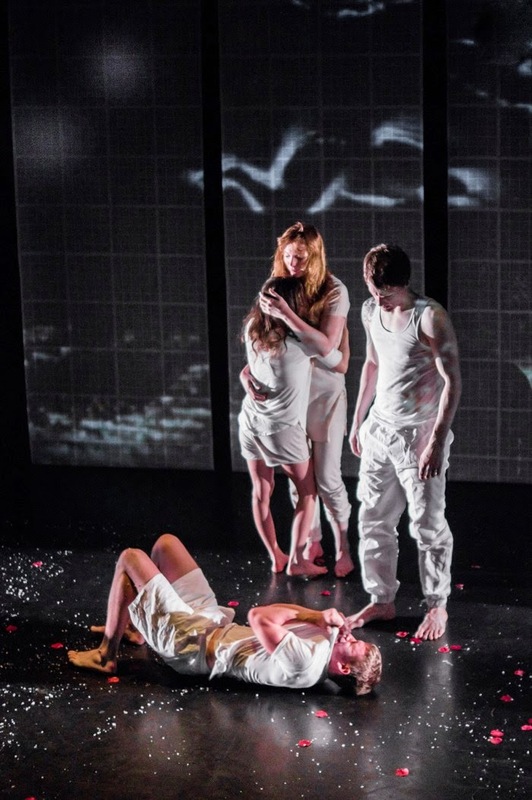 Tmesis Artistic Director Elinor Randle steps back from performance for the first time in a decade to direct a group of four performers, all of whom deliver some beautiful form in their movement and bring passion, despair, wit and charm to bear in the ebb and flow of the work. Adam Davies, Elena Edipidi, Jennifer Essex and Ross McCall work together almost as a single unit at times, and at others play out solo and group scenarios. That’s Amore is both though provoking and hugely entertaining, and is guaranteed to make you smile. Touring from 4th February via: Norwich Arts Centre, Rose Ormskirk, The Met, Bury, Square Chapel Halifax, The Brindley Runcorn until 27/02/15 at Barnsley Civic.